Interstate 77 connects the eastern Great Lakes region with Appalachia and the Southeast. The freeway begins at Cayce on the south side of Columbia, following the Southeastern Beltway to Fort Jackson and I-20 near Forest Acres. The remainder of the route in South Carolina leads north to Rock Hill and the Charlotte metropolitan area. Within the Tar Heel State, I-77 travels directly through the Queen City of Charlotte, serving Downtown in conjunction with Interstate 277, the John Belk and Brookshire Freeways. Leading north as a busy commuter route, I-77 sees heavy traffic from Downtown to Huntersville and Mooresville, with express toll lanes planned. The freeway remains well traveled to Statesville and the cross roads with Interstate 40. The remainder of I-77 north from Statesville to Fort Chiswell, Virginia is a rural but busy truck route. The stretch is highlighted by the Blue Ridge Mountains, which offers both scenery and potentially foggy conditions through Carroll County. 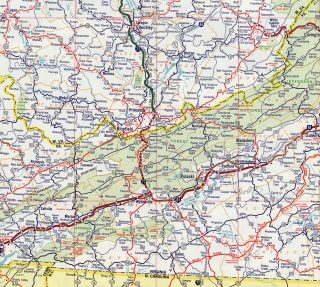 A nearly nine mile overlap takes I-77 east-west along Interstate 81 to Wytheville. Coinciding with U.S. 11 and 52, cardinal directions along I-77 & 81 run opposite one another in what is sometimes referred to as a wrong-way concurrency. Resuming a northward heading from Wytheville, Interstate 77 traverses a series of mountains to Bluefield, West Virginia. Tunnels take the route below Big Walker Mountain and East Mountain. Within the Mountaineer State, I-77 transitions into a toll road at U.S. 460 outside Princeton. The West Virginia Turnpike takes the route north to Beckley, where it combines with I-64, and heads for Charleston. Running along the Kanawha River into the capital city, Interstates 64 and 77 separate outside downtown, with I-77 turning northeast briefly to Interstate 79. I-79 joins Charleston with Morgantown and Pittsburgh while I-77 remains along the former U.S. 21 corridor north to Parkersburg and Marietta, Ohio. Advancing north through the Buckeye State, Interstate 77 stays rural to Cambridge, where Interstate 70 crosses paths. The route becomes increasingly busy from New Philadelphia into Canton, where U.S. 62 overlaps from separate east and west freeways. Suburban type development continues along the I-77 corridor from there north to Akron. 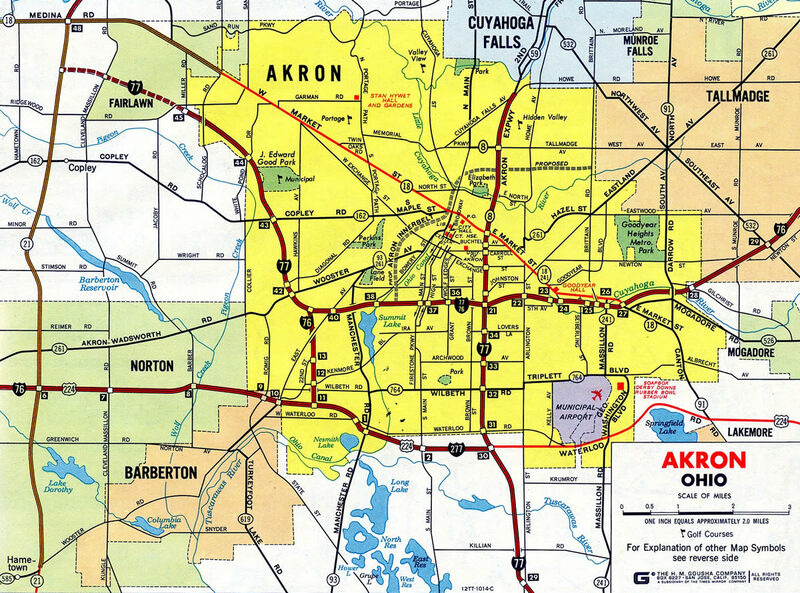 Interstate 77 forms an L-shaped route through Akron between I-277 & U.S. 224 and a three mile overlap with Interstate 76 south of Downtown. 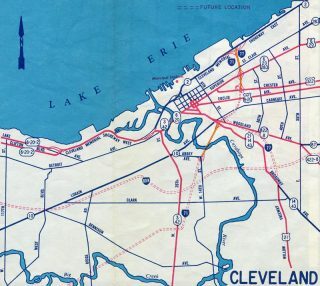 The freeway remains westerly to Ohio 21 (former U.S. 21) near Fairlawn, where it makes the final turn toward the Cleveland area. I-77 and Ohio 21 parallel one another north to Independence and the Willow Freeway leading into The Forest City. The route concludes at Interstate 90 just south of Downtown. 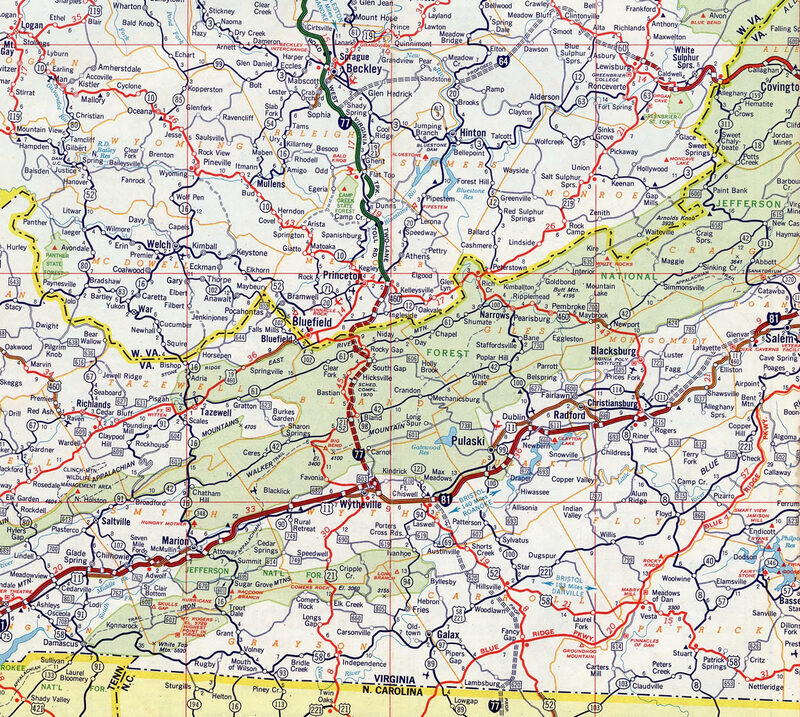 Largely following the original route of U.S. 21, Interstate 77 parallels or overlaps with U.S. 21 from Columbia, South Carolina to Wytheville, Virginia. Northward through West Virginia to Cleveland, Ohio, I-77 replaced U.S. 21, which was truncated in stages between 1974 and 1979. Interstate 77 ended at Charlotte, North Carolina from the north until June 23, 1969, when AASHTO approved the southward extension to Columbia, South Carolina. Completion of I-77 southward to I-26 was formally recognized by AASHTO on April 22, 1995. This extension brought Interstate 77 south from its previous end at Interstate 20 to its ultimate terminus at Interstate 26. Interstate 326, which was briefly in existence on the freeway section between I-26 and South Carolina 48 southeast of Columbia, was subsumed by the extended I-77. The gap between I-20 and S.C. 48 was closed prior to the renumbering. The temporary routing of I-77, signed on Interstates 20 and 26 around Columbia, was also eliminated in 1995. Within Iredell and Mecklenburg Counties north of Charlotte, the I-77 Express Lanes project will convert 26 miles of freeway, between Exit 11 (I-277) to Exit 36 (N.C. 150), to incorporate either one or two HO/T lanes. The lanes will run in tandem with the free general purpose lanes, but incorporate a variable toll rate on single occupant vehicles or HOV-2 motorists. HOV-3 eligible vehicles will be able to use the roadway free of charge. The public-private partnership based project, highly contested by area residents, is estimated to cost $647 million and take three years to complete. Interstate 77 was constructed initially from Wytheville north to Princeton, West Virginia. This stretch includes the Big Walker Mountain Tunnel, which opened in 1972, and the East River Mountain Tunnel at the state line, which was completed in 1974. Early 1960s maps for Ohio showed Interstates 71 and 77 overlapped along the Innerbelt Freeway north to the Cleveland Memorial Shoreway. The Shoreway was proposed as the mainline for I-90 west from there to the unconstructed Parma Freeway. The Parma Freeway was to run south from the Shoreway to the Northwest Freeway (I-90 today) and York Road at North Royalton. As part of the Innerbelt Project in Cleveland with Interstates 71, 77 and 90, changes were made at the north end of I-77. The southbound on-ramps from 9th and Ontario Streets were removed and loop ramps along I-90 east replaced with a single ramp to East 9th Street north. This movement to the southbound beginning of Interstate 77 was replaced by an upgraded boulevard along Orange Avenue (U.S. 422 & Ohio 14) to 30th Street. See Pages – I-77 Ramp Reconfiguration (ODOT) for details and ramp schematics. 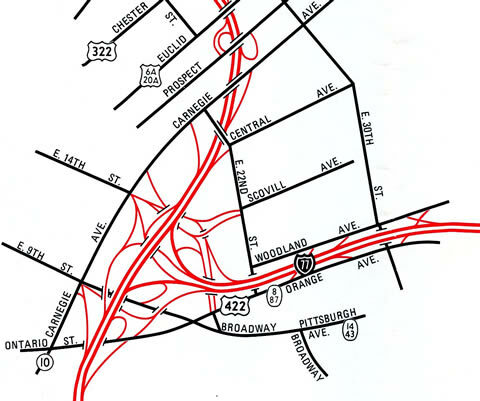 The original interchange layout joining Interstate 77 (Willow Freeway) with Interstate 90 (Innerbelt Freeway) – 1990 Cuyahoga County Engineers Map. Leaving the four-level interchange with Interstate 490, motorists along I-77 see an end sign and the first overhead for Interstate 90. All signs for I-90 on I-77 north were changed to reflect Erie only as the westbound ramp to I-90 closed in April 2011. Photo taken 09/30/10. The northernmost mile of Interstate 77 sees four off-ramps starting with Exit 162A to parallel Woodland Avenue (U.S. 422 & Ohio 8) at the Central and Industrial Valley neighborhoods. Photo taken 09/30/10. Three lanes of Interstate 77 north proceed to Exit 162B to East 14th Street north to Downtown and East 22nd Street to Central Cleveland. I-77 north defaults onto I-90 east beyond the loop ramp for East 14th Street south. Photo taken 09/30/10. Progressive Field (home of the MLB Cleveland Indians) comes into view as Exit 162B departs for East 14th Street north to U.S. 20 (Euclid Avenue). Interstate 90 encircles Downtown along the Innerbelt Freeway. Construction through fall 2016 replaces the 1959-viaduct across the Cuyahoga River leading south from I-77. Photo taken 09/30/10. Northbound I-77 at the former westbound ramp for Interstate 90 toward Toledo. This ramp was removed as part of the Innerbelt Project. Photo taken 09/30/10. Exit 163 loops onto East 14th Street south ahead of Orange Avenue (U.S. 422 & Ohio 8) for East 9th Street, Progressive Field, Quicken Loans Arena (home of the NBA Cleveland Cavaliers) and Public Square. A single lane otherwise takes drivers onto I-90 east toward Erie, Pennsylvania. Photo taken 09/30/10. Long since replaced button copy signs posted 1.5 miles ahead of the Interstate 77 terminus at I-90 outside Downtown Cleveland. Photo taken 05/25/02. All signs pictured here at the I-77 off-ramp to parallel U.S. 422 & Ohio 8 (Woodland Avenue) were replaced by 2007. The lighting fixtures were removed as well. Photo taken by Tim Kubat (April-June 2006). This button copy panel directed motorists to Cleveland Browns Stadium, the Rock and Roll Hall of Fame, and Great Lakes Science Center via Interstate 90 with a connection to Ohio 2. It was replaced with a fully reflectorized sign by 2007. Photo taken by Tim Kubat (April-June 2006). U.S. 422 & Ohio 8 shifts sides with I-77 from Woodland Avenue onto Orange Avenue as Interstate 77 approached Exit 162B for East 14th and 22nd Streets. Back to back lane drops preceded the ramp split for I-90. Photo taken 05/25/02. With the Cleveland Indians home of Jacobs Field in the background, button copy signs advised motorists of the sharp ramp for Interstate 90 west toward Toledo as Exit 162B parted ways for adjacent East 22nd and 14th Streets. Photo taken by Tim Kubat (April-June 2006). A directional T interchange formerly joined the north end of Interstate 77 with both directions of I-90 (Innerbelt Freeway). The southbound I-77 on-ramp from East 14th Street included a connection to the westbound ramp from I-77 north as well. Photo taken 05/25/02. Replaced signs at the Interstate 77 northbound separation for East 9th Street into Downtown Cleveland (Exit 163) and Interstate 90 east. Erie, Pennsylvania is 96 miles to the northeast. Photo taken by Tim Kubat (April-June 2006). One half mile north of the wye interchange (Exit 172A) with Interstate 77 south on I-90 west. Exit 173A leaves here for Prospect Avenue, one block south of U.S. 20 (Euclid Avenue). Photo taken 09/30/10. Interstate 90 remains below grade on the quarter mile approach to I-77 (Exit 172A) by the Cedar Avenue and East 22nd Street overpasses. Photo taken 09/30/10. 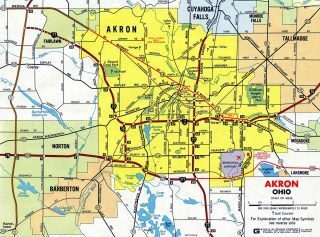 Interstate 77 heads 30 miles south from Exit 172A to Akron. Photo taken 09/30/10. Replaced button copy signs posted at the U.S. 20 (Euclid Avenue) overpass for Prospect Avenue (Exit 173A) and Interstate 77 south (Exit 172A) on I-90 west. Photo taken by Jim Teresco (07/01). Passing under Cedar Avenue on I-90 west, one quarter mile ahead of the original directional T interchange (Exit 172A) with Interstate 77 south. Photo taken by Kevin Vance (01/02). Replaced signs at the southbound beginning of Interstate 77 from the Innerbelt Freeway west. Early 1960s Ohio maps showed I-71 overlapping with I-90 west 1.25 miles from here to the Medina Freeway. Photo taken by Kevin Vance (01/02). The eastbound ramp from Interstate 90 to I-77 south closed permanently by April 11, 2011. The 1959 truss bridge carrying Interstate 90 across the Cuyahoga River was fully demolished on July 12, 2014. Construction on the replacement commenced afterwards. The $273-million project runs through fall 2016. Shortly after the four level interchange between Interstates 90 and 71, the Innerbelt Freeway turned northward by Industrial Valley toward both East 9th Street and Interstate 77 south (Exit 172A). Photo taken by Tim Kubat (April 2006). Exits 171A-B and 172A departed in quick succession from the north end of the Interstate 90 viaduct. U.S. 422 & Ohio 14 originate in Public Square (U.S. 20) to run south along Ontario Street to Orange Avenue. Interstate 77 begins and parallels the pair to East 30th Street. Photo taken by Tim Kubat (April 2006). Exit 171A branched away from I-90 east for U.S. 422 & Ohio 14 (Orange Avenue) east to East 14th Street and Broadway (historic U.S. 21). Back to back loop ramps followed for both Ontario Street north to Public Square and Interstate 77 south and East 9th Street north into Downtown. Photo taken by Steve Hanudel (06/18/06). New ramps as part of the Innerbelt Project join East 9th Street to provide access to U.S. 422 & Ohio 14 (Orange Avenue). The ramp for I-77 south permanently closed. Photo taken Tim Kubat (April 2006). A sharp ramp (Exit 172A) parted ways with Interstate 90 east for both East 9th Street north to Jacobs Field and Interstate 77 (Willow Freeway) south. Innerbelt Project work reconfigured this exit to improve the ramp geometry for 9th Street while eliminating the prong for I-77. Photo taken by Steve Hanudel (06/18/06). The first sign for Interstate 26 appears as I-77 south enters the diamond interchange (Exit 2) with South Carolina 35. This exit opened to traffic in December 1999 as the 12th Street Extension south from the city of Cayce. Photo taken 04/16/12. Four lanes of I-77 south pass over an area of wetlands on the one mile approach to Interstate 26. Trailblazers affixed to the overheads reference the connections with I-20 (Malfunction Junction), eight miles to the north, and I-95 for Georgia and Florida-bound motorists from the Great Lakes region. Photo taken 04/16/12. Exit 1 separates from the southbound mainline for an extend ramp and flyover to U.S. 21-176-321 and Fish Hatchery Road. The US highways parallel I-26 north into Cayce and south to a nearby split. Fish Hatchery Road stems west from the ramp end into the town of Pine Ridge. Photo taken 12/21/13. Interstate 77 ends as two lanes turn northwest along I-26 to West Columbia, Greenville and Spartanburg. The mainline defaults onto a flyover leading south toward Orangeburg and Charleston. Photo taken 04/16/12. All signs for Interstate 26 on I-77 south were replaced by the late 2000s. The replacements display the same information but with larger font on the Interstate shields. Photo taken by Chris Patriarca (06/08/03). Interstate 77 passes over Dixiana Road, and east side frontage road of I-26, ahead of the ramp separation for Exit 1. U.S. 21-176-321 overlap for 8.2 miles from a point east of Pine Ridge to Columbia near the University of South Carolina campus. Photo taken by Chris Patriarca (06/08/03). Unnumbered ramps take drivers onto Interstate 26 as Interstate 77 ends. Trailblazers for I-20 and I-95 were removed here. Photo taken by Chris Patriarca (06/08/03). Heading south from S.C. 302, motorists along Interstate 26 east see two additional exits within the city of Cayce over the next two miles. Exit 115 departs next for U.S. 21-176-321 (Charleston Highway). Ramps connect the US highway trio with I-77 nearby. Photo taken 01/03/14. Construction from 2014 to 2016 extended the six lane portion of Interstate 26 southward into Calhoun County. The widening added a third southbound lane through the directional T interchange (Exit 116) with Interstate 77 north, resulting in new signs. Photo taken by Carter Buchanan (04/10/16). The next APL for Interstate 77 north and Exit 116 appears at the U.S. 21-176-321 (Charleston Highway) underpass. I-77 (Southeastern Beltway) comprises a commuter route for the growing suburbs of Cayce, eastern reaches of Columbia and the Fort Jackson area to Blythewood. Photo taken by Carter Buchanan (04/10/16). Exit 116 departs from the left-hand side of I-26 east with two lanes for Interstate 77 north to Rock Hill and Charlotte. Flyovers here also connect the freeway end with Charleston Highway and Fish Hatchery Road to the west. Photo taken by Carter Buchanan (04/10/16). This set of signs posted two miles north of the Interstate 77 terminus on I-26 east, was carbon copied by 2007. Photo taken by Chris Patriarca (06/08/03). I-26 east expands to four lanes ahead of both Exit 115 to U.S. 21-176-321 and the northbound beginning of Interstate 77. These signs were replaced by 2007; That set was replaced again in 2016 with an arrow per lane overhead. Photo taken by Chris Patriarca (06/08/03). The replacement I-26 and I-77 overheads at the off-ramp (Exit 115) to Charleston Highway were removed in 2016. U.S. 21-176-321 run along side I-26 south to partition in four miles. There U.S. 321 branches southwest 12 miles to Gaston. Photo taken by Chris Patriarca (06/08/03). Interstate 26 passed over Charleston Highway below another set of overheads for Exit 116. Together with Interstate 20 to the north, I-26 and I-77 constitute the Columbia beltway system. Photo taken by Chris Patriarca (06/08/03). Prior to 2016, Interstate 26 reduced to a four-lane rural freeway from I-77 south to Summerville. I-77 comprises a six-lane freeway east toward Fort Jackson. Photo taken by Chris Patriarca (06/08/03). Interstate 26 bisects an area of industrial parks and distribution centers to Dixiana on the two mile approach to the directional T interchange (Exit 116) with Interstate 77 north. Photo taken by Carter Buchanan (04/10/16). Back to back ramps leave I-26 west for I-77 north to Fort Jackson and Charlotte and U.S. 21-176-321 north into Cayce. The initial five mile stretch of I-77 east opened as South Carolina 48 in August 1986. This segment was previously designated as Interstate 326, but never signed in the field. Photo taken by Carter Buchanan (04/10/16). A single lane ramp facilitates movement from I-26 west to I-77 (Southeastern Beltway) north. Interstate 77 reaches Downtown Charlotte, North Carolina in 101 miles. Photo taken by Carter Buchanan (04/10/16). See the Interstate 26 West – Archive for South Carolina for the previous set of guide signs from this direction. “Officials: Interstate construction at halfway point.” The Herald, South Carolina, October 5, 2003. “HIGHWAY SYSTEM’S IMPACT VAST.” Richmond Times-Dispatch (VA), October 7, 1991. “Construction on I-77 toll lanes to begin Monday.” WCNC (Charlotte, NC), November 12, 2015. Page updated April 13, 2016.